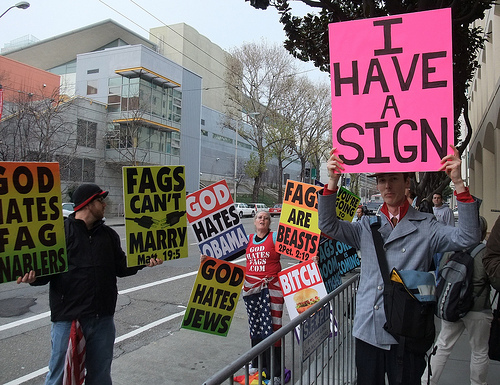 Westboro Baptist. Prosperity Gospel-ists. Seventh-Day Adventists. Post-Millennial/Pre-Millennial Tribulationists. 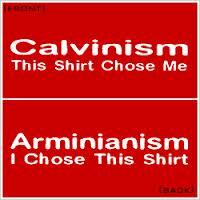 Calvinists. Armenians. The-ark-of-the-covenant-was-actually-purple church. Okay, I made up that last one, but it’s no sillier than the others. Every one of them is some sort of Christian extreme. And that was only a handful. There are extremist sects of Christianity everywhere, and they’re all defining themselves by their views on x, y, or z topic. Here’s the problem: Extreme Christians define themselves by something other than Jesus. They may yet be Christians, depending on the group, but every last one points out a single issue by which they will live and die. The Prosperity Gospel jokers live and die for nameless faith. If you have faith, the mountain will split open with candy like a rocky pinata. The Seventh-Day Adventists will live and die for “soul sleep,” meaning that when you die, your soul is in a cold-storage like state until the end times. Minor issue, isn’t it? The disciples of the End Times will go to war over whether Jesus is coming back before, during, or after the Great Tribulation, or perhaps all of the above! Gasp! And Westboro Baptists gives 100% of their energy to judgement, law, and just making people reeeeaaally angry. Everybody hates extremists. EVERYBODY. Why? Because they’re really not preaching Jesus. They’re preaching Jesus-plus. Jesus plus predestination. Jesus plus law. Jesus plus Cracker Barrel (Omnomnomdenominational faith). And Extremists pat themselves on the back for their taking a stand. But ask yourself: are you taking a stand for Jesus, or just a facet of Jesus? Or worse yet, an issue? I know “Moderation in All Things” is not a Bible quote, but it’s still darn Biblical. 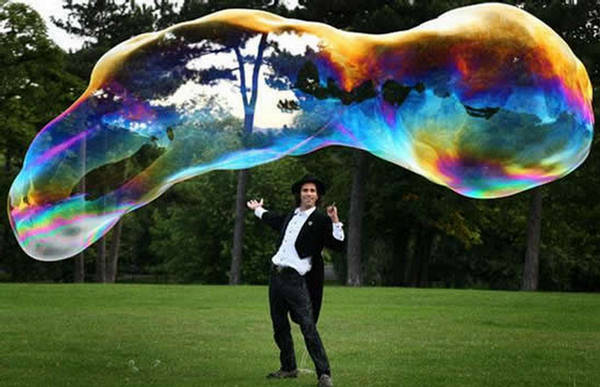 Picture Christianity as a bubble if you will because bubbles are pretty. Christ stands in the middle of Christianity because, doy, he’s Christ. Where should we be in this bubble? As close to Jesus as physically possible (John 15:5, abide in me). Where is the extremist? He’s so fascinated by the mirror sheen of the bubble’s edge, that he’s pressing into it, trying to feel it, see what exactly makes it reflect light in that way, until he pushes so hard that POP! That’s right. Mike B, king of metaphors. Is there anything wrong with agreeing with X train of thought or Y train of thought? No, of course not. But we should define ourselves by Jesus, not a part of Jesus and certainly not a single Biblical issue. The point of moderation is that Jesus defines Christian moderation. He is law, he is grace, he is forgiveness, he is faith, he is good works, he is grace. Jesus embodies all these things and infinitely more. Human error is that which takes one thing and blows it out of proportion. If you have only law, you get Westboro. If you have only forgiveness, you have no need for it. If you have only works, you get exhausted. If you have only faith, you get lazy. And for every other issue, whittle it down to the main point and you get rid of all extremist silliness. Calvinists and Armenians argue over the specifics of grace and sovereignty, but what’s the point? God is sovereign and full of grace. 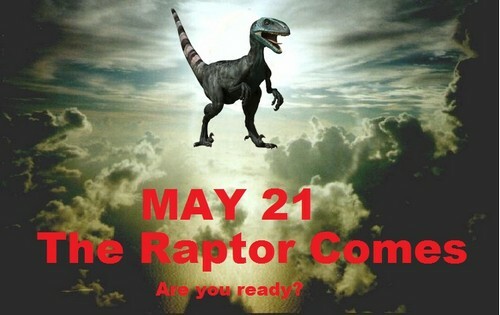 End-times scholars scream with their pitchforks raised high on when Jesus will return. But what’s the point? Jesus be coming back, yo! Now, just as a disclaimer, there is ONE extreme that I’m totally okay with: Christianity. To be a Christian is to stand radically against the whole world and what it believes is right. This is what Jesus means when he said “everyone will hate you because of me” (Mark 13:13). Christianity is extreme, and the verse goes on to say, “But he who endures to the end shall be saved.” God will honor those who stand for Christ when the world says to stand for anything else. This is the one extreme honored by God. Everything else just makes him weep. I stand with Paul. “Is Christ divided?” No, but we certainly are, and it’s all because we get too far from Jesus to examine the particulars. We “miss the forest for the trees,” Jesus says. (John 5:39-40, Message version). Show a little moderation. Take Christ for all he is. The outer edges will take care of themselves if the center holds fast. Especially if your bubble looks like this! I actually laughed out lout at “Omnomnomdenominational faith”. But serious question, from a pretty non-informed Christian (I like me some bible.. past that I get a bit lots) – Calvinists are extreme? I have no clue what makes someone a Calvinist (study Calvin, doh), but I find that a lot of the sermons I listen to usually have a pastor touting his Calvinism ideals. Whole thing makes me scratch my head. Again, I only ask, because I never thought of them as extremist (in comparison to the others you list). Perhaps I should’ve been a little more clear. From what I’ve studied, to agree 100% with the full-on Calvinism rebuffs the free will God gave to us. To agree 100% with full-on Armenianism would say that God is not sovereign. There’s a healthy middle there that says we have free will, but not the power to stop God. There’s a difference between legal ability and physical ability (I’m legally allowed to life 500 pounds, but i physically can’t). As I said, agreeing with this tenant or that tenant doesn’t make you an extremist. It’s when you live and die for that one facet. It all serves to prove one thing – we are not here to serve a “religion”. Religion is man made, not Christ made. No where in the bible are we commanded to “go forth and create so and so religion.” We are to serve Christ, not a man made religion. It’s really that simple. Religions are self-serving, Christ was self-sacrificing. Awesomeness. Yeah, no, not a real word, but whatever. I completely agree with you, been wanting to blog about something similar, touched on it a few times but haven’t been able to plunge into the middle. This is great. It’s extremely frustrating (see what I did there?) when Christians get so riled up over individual issues that they lose sight of the larger picture. It comes to a point where you feel that if you’re not taking part of one denomination then you aren’t *really* saved (excluding Baptist of course, “once saved, always saved!”). Pretty sure God just wants us all to join him in Heaven, and the only way to do that is through Jesus. Shouldn’t we all just be focusing on introducing Jesus to those who don’t know Him? And let us all get along before this car gets pulled over.